99.96% First Time Pass Rate This Year! Initially, we send you the State Application, our Comprehensive Law and Business manual. It contains all you need to know in order to pass the Law Portion of the State Exams. We include our two and a half hour of Law audio CD’s and Video DVD in FULL COURSE. We also include online testing for both sections and more. The Trade manual is included along with our questions and answers structured on the state’s exam with ONLINE UNLIMITED TESTING. You can access all on any computer, iPhone or Andriod. We also include updates and READING Information with LIVE HELP OPEN FROM 9AM TO 9PM 7 DAYS A WEEK. Do I Qualify To Get My Contractors License? You Need 4 years of experience within the last 10 years to qualify for any license. You will need a person that KNOWS of your experience to sign off on the State Application Form. If you’re not sure, call in and we will go over your experience. Pick The Course That Works Best For You. All The Information Is The Same. We will process your application and you will take your state exam in about a month. 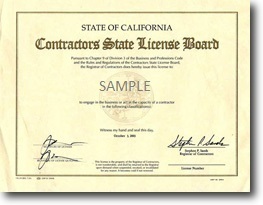 After you Pass, we will set up your Contractors Bond and your license will come in the mail in about 3 weeks! licenses for D35, D56, D49, etc. Law Video DVD 2 1/2 hr. We guarantee that you will pass the state exam the first time or we will refund your full tuition of that portion, PLUS we will pay the state retesting fee.